Caption slip reads: "For Monday. Photographer: Brunk. Date: 07-22. Reporter: White. Assignment: Arroyo--Harbor Freeway link. 29030: Looking south from College Street bridge. On right is Arroyo Seco Parkway 'plug' which, when opened, ties Arroyo Seco Pkwy into Harbor Freeway without a break, under '4-level interchange structure' where all the freeways converge. At left is Figueroa Street, which will have only small inlet into Arroyo Seco Parkway northbound when 'plug' is pulled. 31-32: Looking northward from Alpine Street bridge, where Arroyo Seco Parkway 'plug' is to be pulled ('plug' is merely barriers), allowing southbound traffic to proceed without a break to Harbor Freeway back under the '4-level interchange' structure where all the freeways converge and fan out. The 'plug' extends from College Street bridge to the Sunset Street bridge, a distance of about one half mile. When opened, southbound traffic can go clear to Wilshire Boulevard, then turn east into 2nd, 4th, 6th and Wilshire Blvd. into downtown area, or can go west. The northbound lane will not be opened until Sept. 15, or Harbor Freeway to Arroyo Seco Parkway. 33-34: Junctions of Santa Ana--Ramona and Hollywood Freeways, coming under Sunset Boulevard bridge, as they join new Arroyo Seco Parkway link which ties into Harbor Freeway. Lanes, left to right: 1: Far left is ramp from Santa Ana--Ramona Freeway traffic lanes into Arroyo Seco Parkway, northbound. 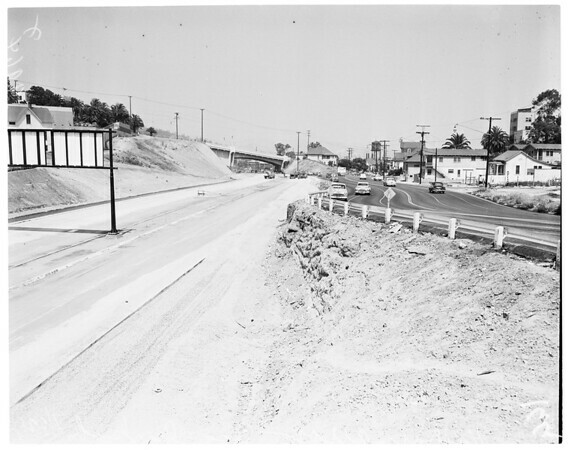 2: Ramp splitting off of this one (above), turning right, is from Hollywood Freeway onto Arroyo Seco Parkway, northbound. 3: To Santa Ana--Ramona Freeways, eastbound. 4: To Hollywood Freeway, westbound."